Instead of heading south for the winter, a Canada goose has been squatting at a Winnipeg car wash, leading a lot of neighbours to come for a gander. 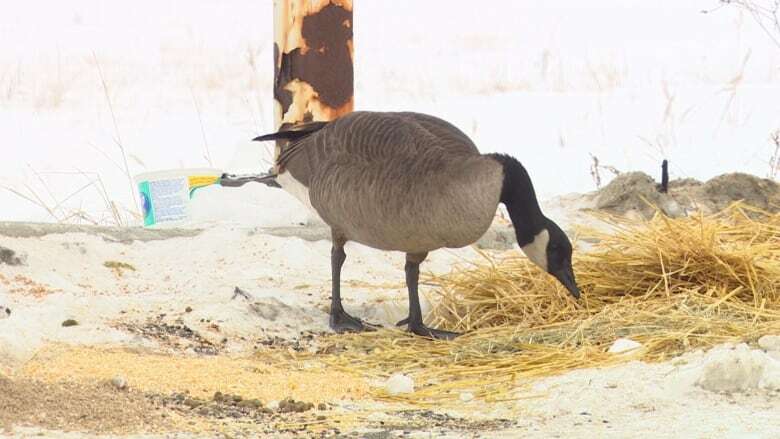 Tiffany Lui, animal care co-ordinator at Wildlife Haven Rehabilitation Centre, says she's received a lot of reports from people living in the community about a goose that didn't fly south and has been living at a Shell car wash on Pembina Highway since October. "We've tried cornering [it], we've tried a couple people going up to it, sneaking up on it, we've tried going through the car wash, and popping out of the car. Nothing's really worked yet … We have a couple other ideas," she said. While it's unclear if or how the bird is injured, she can see a bit of a wobble in its flight. She hopes to capture the bird to make sure it's OK, but every time someone tries, it gets away. "It's been probably one of the most challenging wild goose chases that I've dealt with, since I've started working with Wildlife Haven," she said. Lui says they have been trying to catch the goose almost every day since Christmas. They decided to let it rest over the weekend, and will try again early next week. "It's not natural for a goose to be staying through the winter, through the Winnipeg winter," she said. Lui will bring a new specialized net next time she tries, hoping that will help. Natalie Radchuk, a teacher at the nearby Dalhousie School, realized the goose was living at the gas station in October. "I think he's getting some warmth and some moisture that's coming from those [car wash] doors being open. I could tell he's a pretty smart guy. He's definitely resilient," Radchuk said. Radchuk named the goose Will. "I've never seen an animal with such a strong will to live in these types of circumstances. I mean, we've had some really harsh weather," she said. "He's still strong, he looks really good, he doesn't look dishevelled. The community has really come forward to try to help keep him fed," she said. Radchuk and students from the school brought the goose crushed corn and soy along with bottles of water. She said other people in the community have brought the goose a bale of hay, pellets, lettuce and bread. While she's happy people want to take care of the goose, she hopes he is captured soon. "I'd just like to see him have a chance at life, after everything he's been through."